Bring water and food coloring to a boil in a small saucepan. In a bowl mix flour, salt and Kool-Aid (if you want scented playdough). Make a well in the center of the dry mixture and add the boiling water and oil, stirring constantly. Once the mixture is cool enough to handle (which takes just several minutes), knead the dough for about two or three minutes until proper texture is achieved. 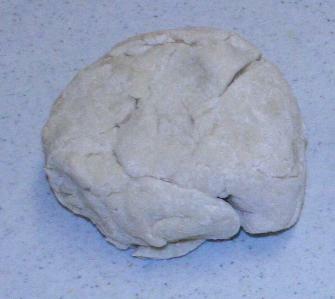 And now your homemade playdough is ready to use! It can be stored in refrigerator for up to 2 months. This homemade playdough recipe is one option to use when making the fruit bouquet baby shower centerpiece. Depending on the size of the vase you use, you might need more playdough. The amount of playdough that the above ingredients make is enough for the vase I used. Make one batch, fit it in your vase and then decide if you need more or not. Note: it shouldn't be above the rim of the vase - a 1/2 inch below the rim is sufficient.